BUFFALO, N.Y. (AP) — Once Cale Makar committed to playing hockey at Massachusetts, nothing was going to change the defenseman’s mind. Makar stuck by his decision despite a coaching change, which led to him rejecting offers to play at higher-profile schools. He then turned down a chance to represent Canada at the Winter Olympics last year because Makar didn’t want to miss out on his freshman season. And not even the lure of making the jump to the NHL — Colorado drafted him with the No. 4 pick in 2016 — could sway him last summer. Each time, Makar cited loyalty and commitment as the reasons he wouldn’t budge. The Hockey East player of the year is one of three finalists to win the Hobey Baker award, issued to college hockey’s top player. 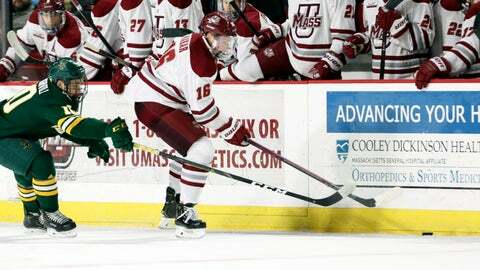 Just as important, Makar has played a key role in helping UMass (30-9) make the school’s first Frozen Four appearance. The Bulldogs are making their third straight Frozen Four appearance and have a chance to become the first school to defend its title since Denver in 2004 and ’05. For Providence, it’s the Friars fifth time in the semifinals and first since winning their lone title in 2015. Much of the focus remains on Makar, who has a shot at joining the Avalanche for their first-round playoff series against Calgary next week, and an UMass program that’s played in the shadows of its higher-profile Hockey East rivals. Carvel immediately reached out to Makar and his family, and was impressed by how they stuck to their commitment. One benefit was Carvel’s firsthand experience in developing NHL players by having worked as assistant coach in both Anaheim and Ottawa. What Carvel wasn’t prepared for was how much maturity Makar has displayed. The coach became emotional when discussing the bond he’s developed with the defenseman that goes beyond player and coach. It pleases Carvel more in knowing how much Makar is being rewarded for the patience and loyalty he’s shown. NOTES: The sons of two former NHL coaches are competing in the tournament. Minnesota Duluth sophomore forward Justin Richards is the son of Todd Richards, currently an assistant with Tampa Bay and former Columbus Blue Jackets coach. Denver junior forward Tyson McLellan’s is the son of Todd McLellan, former Edmonton and San Jose coach. … Providence forward Kasper Björkqvist elicited a laugh when asked if the Friars’ feel more comfortable in high-scoring or defensive games. “It’s when we’re down 3-0,” Björkqvist said referring to Providence rallying from a 3-0 deficit to beat Minnesota State 6-3 in the first round. … Denver coach David Carle got a chuckle when asked if he wished Makar was already playing for the Avalanche. “I’m an Avs fan, so I think he would’ve helped them,” he said, smiling.